With Electronic music reaching a new peak in popularity, "Producers" are everywhere. If you want to stay relevant in today's music industry, you have to be able to produce at a rate that keeps your fans interested. I have even heard it said, a good producer must produce something new, either song, video, or some other type of content for their fans, at least once a week. This may be a bit of a stretch when you are first starting out, so we suggest to set a more attainable goal of at least one new track a month. This week, let's take a look at one of the tools that is largely overlooked by new producers and can save a large amount of time during production: Keyboard Shortcuts. Using Keyboard shortcuts turns your music making process into a smooth progression like typing a letter on your computer. Here are a few of Odesi's shortcuts that can help you save some time in your next production. Undo - Ctrl + Z This command steps the program back in time and removes the last edit you made in the project. Redo - Ctrl + Z This is the opposite of undo. Just in case you decide you actually want to keep that change after all. Copy - Ctrl + C This is the same function as your common word processor, This lets you copy whatever is selected. Paste - Ctrl + V This also works just like in a word processor. This pastes your copied selection where your cursor is placed. Cut - Ctrl + X This works just like copy, only it removes whatever you are copying from the original location. Duplicate - Ctrl + D This works just like copy and paste, the only difference is it will always automatically paste what you are duplicating into the next available space in the beatgrid. Select All - Ctrl + A This allows you to select all notes and patterns in your project. The + and - buttons allow you to increase or decrease your note length in pencil mode. Delete - this button will delete anything that is selected in your project. Play/Stop - Spacebar Hitting the spacebar triggers your songs to play or to stop. Loop - Press L to set a loop. Pencil - Press P to enter pencil mode and draw your notes by hand. Record - Tab This allows you to record notes played on your MIDI Keyboard. If you do not have a MIDI Keyboard, You can use QWERTYUI, ASDFGHJKL, and ZXCVBNM as a piano style keyboard to play your notes. Change Piano Scale - [ and ] These shortcuts allow you to change the piano scale to what best suits your project. Quantize - Ctrl + U This allows you to snap your notes to the closest 1/16 note on the beatgrid. 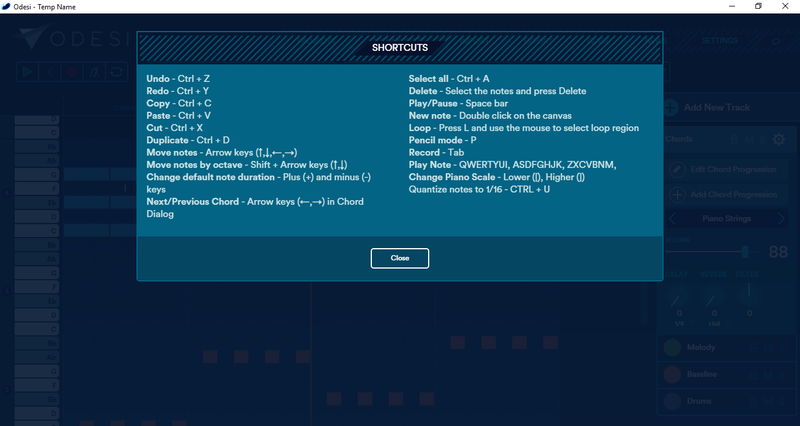 You can also move your notes around the beatgrid using the arrow keys, or move them by octave by holding shift while using your up and down arrow keys. Your left and right arrow keys also audition chords in the chord dialog. With these tools at your fingertips, you are guaranteed to streamline your production process within Odesi. Please Like, React, and share this on Facebook and let us know which shortcut you use the most.